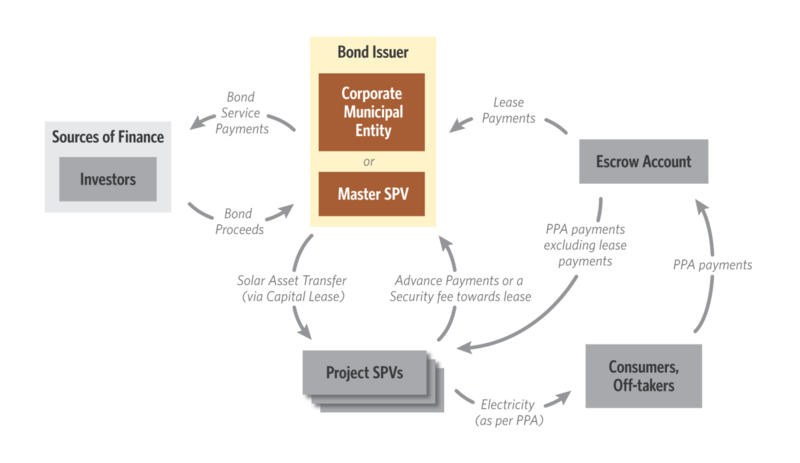 The study proposes propose a transaction structure wherein a special purpose vehicle (SPV) or a corporate municipal entity (CME) owned by the municipal corporation would raise the green bonds and disburse the proceeds of these bonds to SPVs owned by project developers via capital lease arrangements. In our paper, we also provide a detailed roadmap for municipalities to deploy the proposed model. After the installation and payment is complete for rooftop solar, cash flows would funnel back to the initial capital financiers. The proposed transaction structure is a Public Private Partnership (PPP) approach, similar to the Design-Build-Finance and Operate (DBFO) model with financing activity taken care by a public entity such as Municipal Corporations.